I am not one to prepare for disasters. People can tell me a thousand times that severe thunderstorms are approaching, that a dry spell is forcasted or that a shortage of something essential like water (or coffee) will happen, and no, I will not be among the first to run for shelter nor stock up on provisions. I don’t know if it is my continuous belief that despite humps and downs eventually things turn out OK or if I am lacking an alarm button…I just don’t panic. When I took it as a serious matter to go to the grocery store in the middle of my work day, at a rather inconvenient time, it wasn’t because there is a strong snowstorm coming (though my boys did give me an absurdly long grocery list to prepare for it), it was because we ran out of Mexican avocados. The grocery store was wild: an insane crowd was moving around the isles, lines like I have never seen at the cashiers and empty shelves throughout. But oh!…there they were: some beautiful ripe Mexican Hass avocados waiting for me to bring them home. Although we use avocados at home for an infinity of things… we also love guacamole. It just never gets old around here, nor I think, anywhere. Yet, one of the versions I like the most uses Chipotle Chilies in Adobo instead of fresh Jalapeños or Serranos. 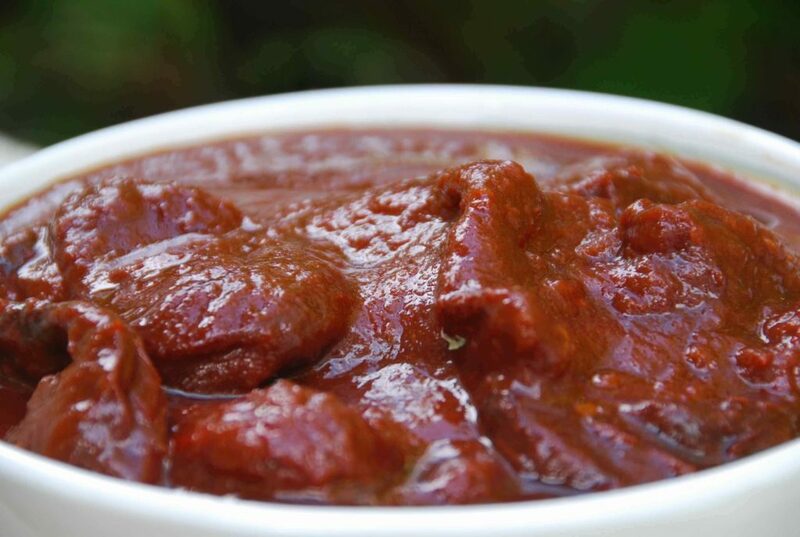 The creamy, silky and mild nature of the avocados takes a jump into the sky when paired with the smoky, spicy, rich and complexly flavored Chipotles in Adobo. It may be that avocados work so well with chiles, because avocados are one of their natural soothing counterpart: the spicy element in chiles called capsaicin which is an oily substance, dissolves best in other oily elements, alcohol or milk products. Avocados, being oily in such a wholesome way are the remedy to the heat in the same bowl. This being said, if you feel like pumping up the heat and flavor by adding more chipotle chiles, you may want to pair this guacamole with a nice cold beer. And while you are at it, why not scoop some Mexican style cream or sour cream on top of the guacamole too. YUM. Needless to say, this recipe takes less than 5 minutes to prepare. But most importantly given the date, this is my loved contribution for your Super Bowl gathering… whether it turns out to be a disaster or a party (!). Make extra portions as it flies as soon as you mix it all up. And since no guacamole is complete without corn tortilla totopos or chips, here is a link to help you make some at home. Gently mix ingredients in a bowl and serve. 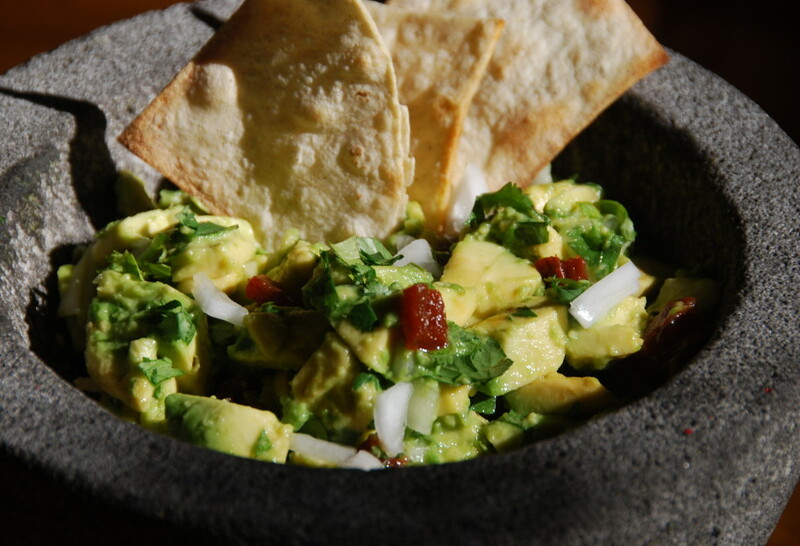 Guacamole can be prepared up to 12 hours in advance if covered and stored in the refrigerator. Eat on its own, as a side, as a topping, or scooped with tortilla chips, toast squares, pita chips, crackers or vegetable sticks. Pati this is the BEST guacamole that I have ever tasted. I will be making this again and again!! Thank you!!!! Looks delicious! Parties do not have to traditional in order to be simple. You can serve various kinds of dishes to cater to the various preferences of food and taste of your guests. I tried your receipe today but I added mango and it turned out delicious. I have made guacamole before but I never diced the avocados. Your technique of dicing them made the guacamole look really good. I love this recipe! By the way, my mom always uses garlic and fresh cheese, and Jalapeño peppers… not to be prejudiced, but my mom’s guacamole is the best!!! P.S. The lemon juice is to prevent the avocados from turning brown… by using the lemon juice it will always be nice and green… always remember not to use too much lemon juice as sometimes you will overpower the flavor. Sounds very good. Do you generally leave out garlic when you make guacamole? Is garlic not a traditional ingredient in guacamole? The reason I ask is because I’ve always included garlic and never thought twice until I saw this recipe. Wow! I am sooo excited to try this out! Made my mouth water while reading, and I can but imagine what it tastes like. Thanks for an awesome recipe Pati! Hehe. I had a similar experience yesterday at the supermarket. Madness. Yet, because I know my taste is not that of most people’s, I knew I’d find what I needed. Lo and behold, there they were: Poblanos, avocados, papayas. Will try out this guacamole this weekend! Thanks for posting it.